Russell puts on a great show, despite his annoying habit of trying to greet everyone in the audience by name. 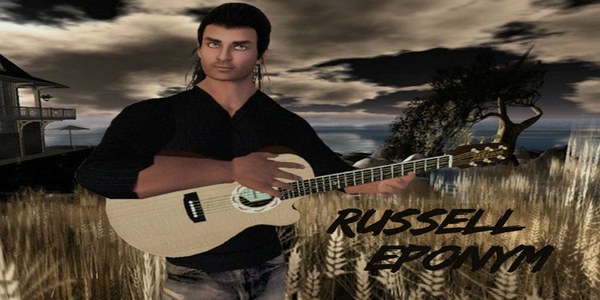 By far my favorite musician on Second Life. His songs have meaning and message, his guitar playing elegance and skill, and his voice is crystal clear and warm. His shows have the best entertainment value I have seen. I love the way he greets everyone – makes each member of his audience feel pretty special. I’m sure this man puts a spell on us when he performs. Not complaining though. Always magical. Le meilleur chanteur et musicien dans SL. Le rosignol gallois. I could listen to Russell every day of the week for pure relaxation, He involves every member of the audience by welcoming them and making them feel right at home. As a venue owner that truly believes in the personal touch, he is one of the very best. That he was voted as the avi choice as Favorite Male Musician does not come as a surprise to me. It is an award that is truly deserved. Exceptional performer in every way. Russ is a fantastic guitar and banjo picker and each show is a fresh experience. I heard a rumor that he has extra fingers. Smooth voice, nice music but I can’t understand ballyhoo about this performer.